There are three main objects that need to be setup for this to work. Oh right, the ViewController needs to match the protocol defined by WKScriptMessageHandler. This means implementing the userContentController delegate method. Onwards to the code examples. Start by importing WebKit and declaring that ViewController implements the WKScriptMessageHandler protocol. This is done in the header file (ViewController.h). Moving to ViewController.m, start with the URL constant and @interface declaration. I’ve setup a JSBin which helps with the example. The guts of the next part relate to the overly-verbose object instantiations described above. 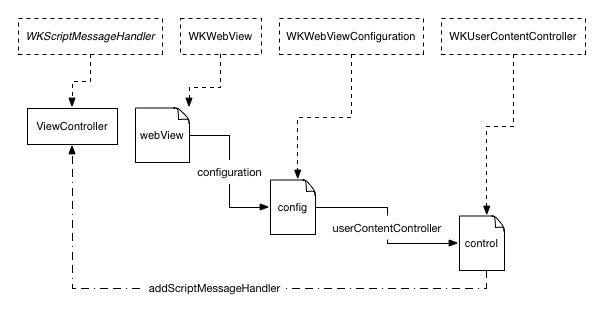 Creating a WKWebViewConfiguration object so a controller can be added to it. Adding a script handler to the controller and setting the userContentController property on the configuration. Create an NSURL object and instantiate the WebView. Load up webView with the URL and add it to the view. Start by setting up a bare-bones HTML page. Here’s a quick demo video of everything working. Full source for both the iOS application and HTML components is on GitHub under joshkehn/JSMessageExample.